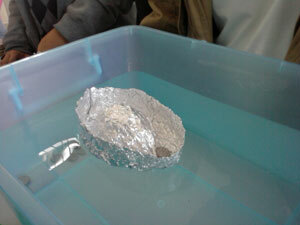 Question: How buoyant can you make your tin foil boat with added weight? Aluminum foil (also known as tin foil) has a buoyant attribute. Which means the tin foil wants to stay above the water and is being pushed by this force. On the other hand, gravity is pulling it down and wants it sink to the bottom of the water. With the addition of weight, there is only so much that the tin foil can withstand until it submerges. Try discovering how your buoyant tin foil boat can stay above water with the addition of pennies. Identify what is the main problem you are going to be solving. Once you know the problem you should be solving, identify the variables you should be looking into to formulate your response. These variables would be definitions of key terms, known theories, previous studies or experiments, or any other sources. Now that you have done the research, you should have enough evidence and knowledge to provide a sound hypothesis. A hypothesis is an educated guess that you base off of your findings and research. The main model behind any good hypothesis is, 'this will happen because of this'. The second part should bring in a specific piece of your research that backs up your assumption. For example, 'The cat will jump higher than the dog because of their muscle anatomy'. Now the fun begins! You get to design your experiment based off of your findings. First, assess what materials you are going to need for your experiment. Next, write down a detailed description of the procedure in steps, as if explaining to someone for the first time with no knowledge of the subject. Keep a detailed document of all of your findings. Lastly, you are going to take all of your data and conclude whether your hypothesis was proven true or false.